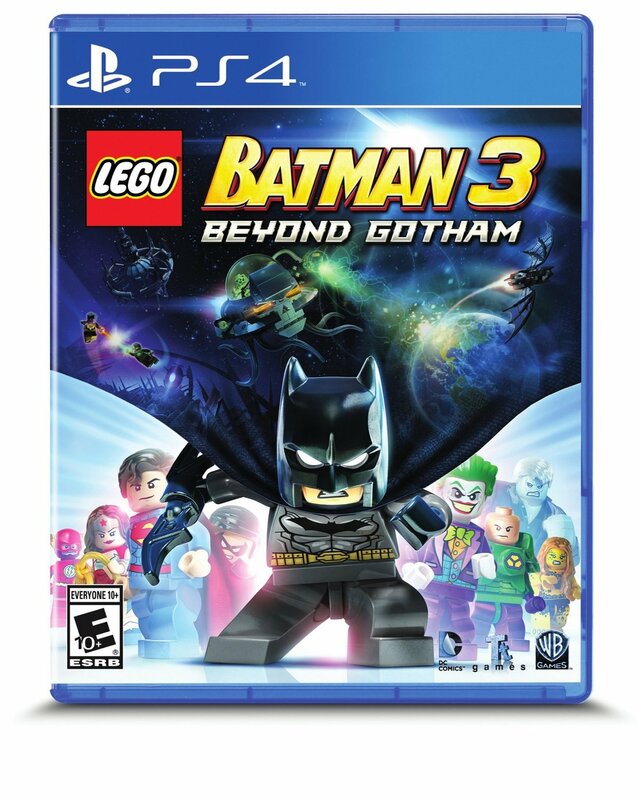 Now that this LEGO game series has connected the Dark Knight and Boy Wonder to their DC superhero counterparts, developers TT (Traveller’s Tales) expand the gameplay in LEGO Batman 3: Beyond Gotham with even more action, content, and extras plus the first ever Season Pass for a LEGO game to nab all the substantial downloadable content (DLC) and extras nicely coinciding with Batman’s 75th anniversary. This action-adventure video game is the direct sequel to LEGO Batman 2: DC Super Heroes that had a special ending featuring Brainiac, which leads right into this third installment. Publisher Warner Brothers Interactive Entertainment packages great content and with plenty of DC Comic characters, special references and bonuses. Initially set in Gotham City, the main plot goes universal…literally. The on looking spectators are gone as players encounter several heroes and villains with spoken dialogue throughout the story. This somewhat linear campaign has several hidden secrets and bonus items like collectible red LEGO bricks. This game is easy to pick up and play, but definitely requires a small to medium learning curve through tough challenges, and action tasks are considerable even for experienced players. Know the controls, actions, and characteristics to save time…or just get the helpful Prima Official Game Guide, which includes very handy quick-reference item checklists. Players can try for bonuses like the “Same Bat-Time! Same Bat-Channel!” level on their own, but the game guide saves time. It’s a very, very large world now, so developers use a large world map so players can navigate where they want to go. Environments include the lantern worlds (Zamaron and Odym), the Hall of Justice, the Batcave, and the Justice League Watchtower plus many settings in space. The visuals are sharp, but need better transitions among cutscenes and gameplay plus improved set design to navigate and move characters through the environments easier. Each hero and villain have unique actions. Weapons use, movements, and special actions can be tricky, but don’t change much from the previous LEGO Batman installments. The free moving target feature using the left analog stick, which also controls movement. The spice of variety freshens this installment and improves the overall gameplay, which often demands long game sessions since there are several challenges between each save point. Besides more checkpoints, players need a free will off option to keep one partner stationary instead of falling off edges or creating other issues. Players can easily switch among other characters (usually more than two) using multiple buttons. Movements can also be a challenge, especially when traversing through a tight spot. Players can also occasionally get stuck in certain spots. Some repetition can dampen the game though developers do have a sense of humor about the action. For example, Robin says “I’m really tired of getting shot at” in a circular space shoot ’em up (actually resembling another PS4 game, Resogun) just as players finish the challenging level after endless shooting barrages. The “destroy then build” theme still hold true as players break stuff then look for visual cues or other elements to activate certain actions. Characters can also manipulate their own gear and gadgets, which would be overwhelming without the helpful cues. Players basically don’t use them until prompted. Robin’s gadget is particularly tricky, but just press the triangle button to get out of it. Other actions require players tap a button instead of holding it and vice versa. Main movement frustration came when finding certain spots (e.g. digging for moon rocks) where developers needed more of a “buffer zone” within the environment. The physics are not meant to be precisely accurate and the game leaves some room for error including multiple progress options. Younger players may occasionally get stuck in their progression, but the available help, smooth controls, absent time limit, and unlimited lives can quickly help players past challenges. The Bat-Mite is also playable and helps guide players through the game when activated by hitting the Batman Question Mark pieces. Besides the main story players can also complete extra side missions like saving Adam West. Players can also use special views depending on which character they have. The worthy character cache includes Alfred Pennyworth, 1960s Alfred, Aquaman, Bane, Batgirl, Bruce Wayne, Darkest Knight Batman, Catwoman, Cyborg, Deathstroke, Doomsday, Flash, General Zod, Green Lantern, Harley Quinn, Joker, Jor-El, Killer Croc, Lex Luthor, Mr. Freeze, Penguin, Poison Ivy, Ra’s al Ghul, Riddler, Robin, Solomon Grundy, Superman, Superboy, Supergirl, and Wonder Woman. Conan O’Brien and Kevin Smith even get in on the action as playable characters. The talented voice actors include Troy Baker (Batman), Olivia d’Abo (Star Sapphire), Nolan North (Beast Boy, Firestorm, Mad Hatter, and others), Tara Strong (Harley Quinn, Poison Ivy, and others) plus Adam West as himself and Gray Ghost. Players unlock playable characters and character tokens as they progress through the game or purchase character tokens and purchase in the store. Batman, Robin, Cyborg, Lex Luthor, and The Joker can wear suits that modify their abilities. The suits are unlocked through storyline progression. The special suit actions work well except developers could have eliminated the switch option when only one suit is available. Different suits have different abilities including freeze cannons, explosive, lasers, mind control, self-healing, illumination, magnetic, X-ray vision, fire resistance, sonar, and resistance to certain elements. The strong variety in the overall gameplay, challenges, minigames, and other areas echoes previous DC experiences as well as other familiar media like the neon-colored Tron-like block maze challenge where players have to think quickly. Well varied boss battles instead of repetitive barrages would have improved the game. The DLC Season Pass, currently available for $14.99, is a solid value. Season Pass packs can be purchased separately for $2.99 each if you want to be more choosy. The DLC also includes special characters including The Dark Knight Rises Bane, 75th Anniversary Batman, Rainbow Batman, Vampire Batman, The Dark Knight Rises Selina Kyle, Nurse Joker from The Dark Knight, Batman Begins Scarecrow and The Dark Knight Two-Face. The Danny Elfman music score from the first and second Tim Burton directed Batman films is still very prominently used. The sound prompts, characters expressions (e.g. confusing shrug means change suit or character) and some amusing sound effects. LEGO Batman 3: Beyond Gotham offers formulaic fun with beat ‘em up action, problem solving challenges and enough variety for a decent recommendation, but has plenty of room for improvement. Recommended (*** out of four stars). Also available for 3DS, iOS, Mac (via Steam), PC (Microsoft Windows), PlayStation 3, PlayStation Vita, Wii U, Xbox 360, and Xbox One. This entry was posted in Video Game Reviews and tagged Batman, LEGO Batman, Michael Siebenaler, Mike Siebenaler, Tall Writer, video games. Bookmark the permalink.